Our farm currently has hundreds of buzzing boxes of bees strategically placed around the property. We recently caught up with Kelly O’Day from Kona Queen Hawaii. He is the man with a plan when it comes to our current bee population and honey production on the farm. Is Hawaii a good place to raise bees and produce honey? He answered that Hawaii was indeed an ideal location for bees and honey. Something is always in bloom nearby on the Island. The bees, having a foraging radius of about three miles. They never struggle to find pollen and nectar which is essential to their growth and health. What kind of bee do you use? Are they aggressive? The bees used and cultivated by Kona Queen Hawaii are of the Italian and the Carniolan species. Both species are popular with beekeepers around the globe because of their reputations of having a mild temperament. The Italian honey bee is by far the world's most popular and most commonly cultivated bee and probably also one of the least aggressive. The Carniolan honey bees are becoming increasingly more popular. Although they may be a bit more protective of their hives, they tend to produce about 15% more honey on average throughout the year. In general, honey bees are not aggressive out in the wild. When they are performing tasks, they will not sting unless provoked. Closer to the hive they can become more aggressive if they feel their hive is threatened. How do we get the Kona Snow honey? 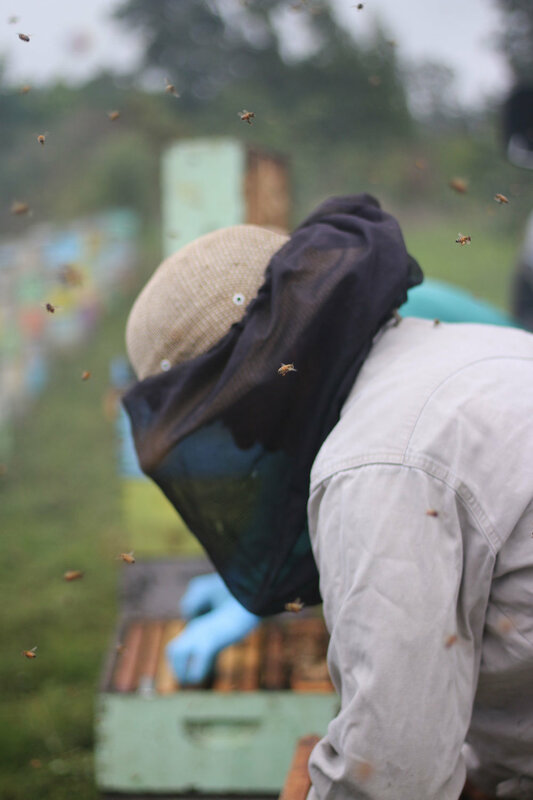 Before the initial blossoming of the coffee trees on and around our farm, the nearby honey producing hives are harvested and most of their honey is removed. 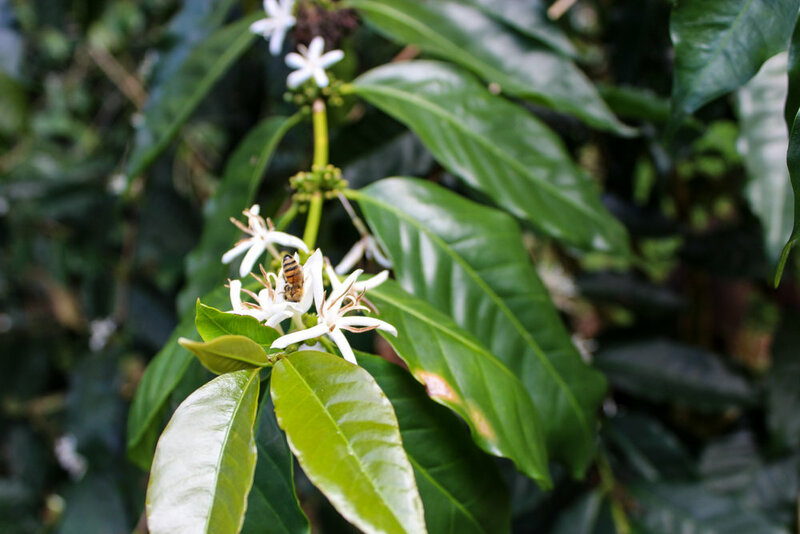 During the “Kona Snow” bloom the bees will collect pollen and nectar from the nearby coffee blossoms and convert it into delicious honey. 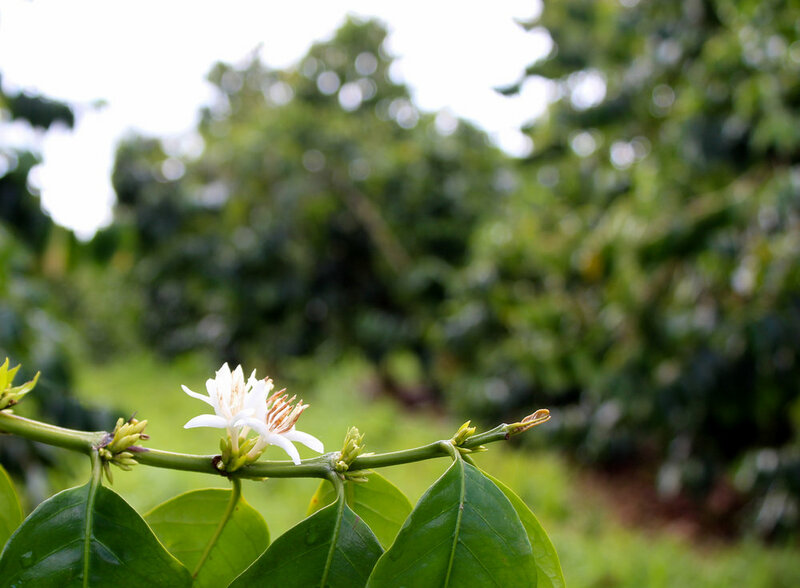 Towards the end of the coffee tree bloom, the newly produced honey will again be harvested. This ensures that the honey produced is substantially infused by the nectar and pollen of the nearby coffee cherry blossoms. What are bees good for besides honey? Honey is not usually the main priority of businesses looking to add bees to their farm. Having bees on a farm or orchard is primarily about more efficiently pollinating crops. 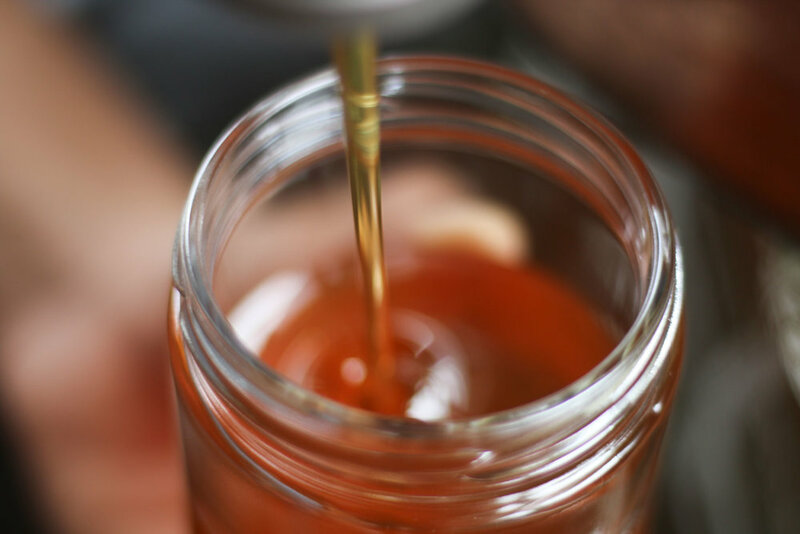 Aside from producing honey, many large companies such as Kona Queen Hawaii maximize their investment by also cultivating support colonies and raising queens. These support colonies and queens can be shipped all over the world when needed. Along with filling the need of farms and orchards around the globe, the cultivation of bee colonies and queens can be essential in areas where storms, fires, natural or manmade disasters may have adversely affected the local bee population. Companies like Kona Queen Hawaii can supply bees, queens and support colonies for such emergencies as well as provide pollinators for countless farms and agribusinesses around the globe. The staff at Kona Queen Hawaii, is dedicated, hardworking and committed to quality. More than 30 employees drive to countless locations across the island every day to perform necessary maintenance and quality control. Every colony is unique. It is part of what makes beekeeping such a majestic, artful vocation. There are so much complexity and culture happening in all these individual colonies. It’s intoxicating. Beekeeping is more an art or a passion than a vocation. We thank Kelly and his crew at Kona Queen Hawaii for caring for the bees that pollinate our coffee, make the Kona Snow Honey, and produce queens. You can taste the fresh batch of Kona Snow honey, harvested this spring. Now available in our online shop and in our café in Kailua, Kona. IF I COULD LIVE IN ANY BOOK IT WOULD BE: I’d love to be an elf in the Lord of the Rings world. Especially in peaceful times. I’d just love to be able to move like that and have such an intimate relationship with nature. I've been involved in the coffee industry for about 17 years. I've been a barista for many years, then a trainer and consultant. I am big on sharing relevant knowledge that will help coffee lovers have the optimal coffee experience. Working with Kona Coffee & Tea Company is like a dream come true. I can't say how rewarding it is to work with such a great product from seed to cup. From the very beginning, being part of the team here, I've felt like family and have been treated like family. The spirit of Aloha is strong as is their dedication to community and quality.